Uniquely Shaped Rubber Balls for Soft and Squishy Fun! Stuff Points: Earn 7 points when you buy this stuff. Usually Ships Within 24-48 Hours. An alternative to traditional foam and plush toys, Rubbabu Balls are made from a natural rubber foam and then covered in a bright, colorful flocking. 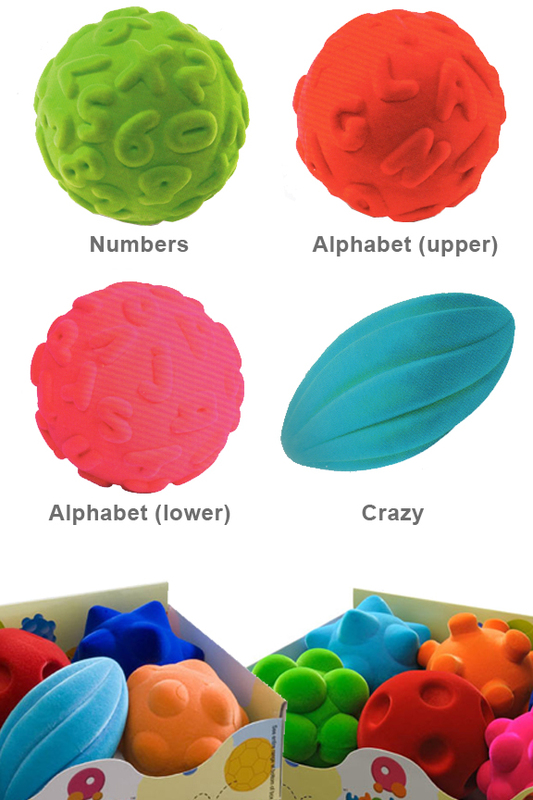 These uniquely shaped balls feature shapes and textures that make them perfect for small hands, and ideal for all types of play. Children can easily grip and catch these great balls easier than traditional versions thanks to the clever shapes and the soft and squishy materials. These are the perfect toy for sensory exploration and will help children to improve gross motor skills and hand-eye coordination. 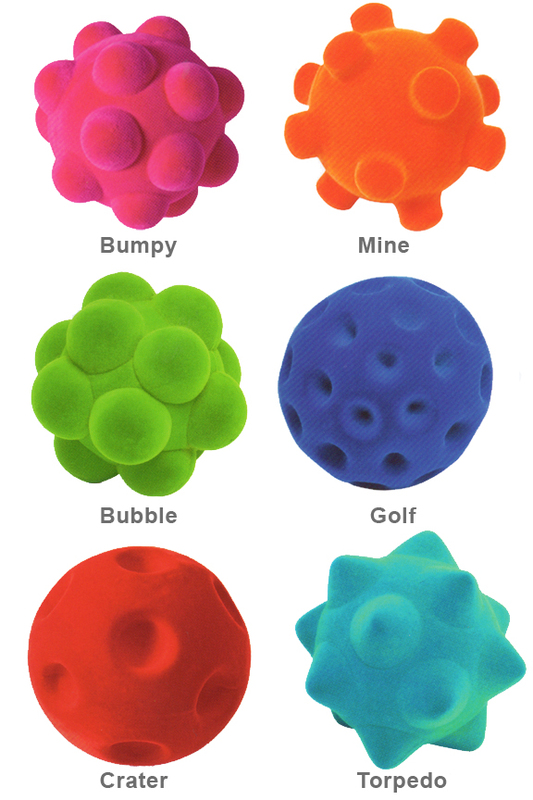 Rubbabu foam balls have a wonderful tactile appeal and are available in six different shapes. Choose your favorite one, or order several at a time for reduced pricing. They are perfect for virtually any child and can be used both indoors and out. These balls are amusing for young children, but they also remain useful and fun as children age. They are great for rolling, tossing, catching, and bouncing and are one toy that you have to feel to truly appreciate. They are substantial in size, but remain reasonably safe for indoor fun without worry of accidents. These colorful toy balls are made entirely of 100% biodegradable, all-natural rubber, and then are covered with a velvety, bright and fun nylon coating. They are soft and squishy to the touch, yet sturdy enough to handle years of abuse. Due to the size, shape and texture, these balls can easily be classified as sensory balls. When held, children can appreciate the soft and smooth texture and notice the pleasing squishyness, while increasing their sensory awareness. These foam sensory balls are sure to please. They are great for children of all ages. Smaller kids will reach for, roll and crawl to them. Older children end up kicking, throwing and playing more advanced games with them. Safe and natural materials ensure a high quality toy that children will play with for years to come. Bright colors, soft textures, and a super squishy and bouncy make-up help these balls to be truly unique. They are perfect for the development of socialization and gross motor skills as well as sensory enhancement. Despite their simplicity, Rubbabu Balls are incredibly versatile and educational. 100% biodegradable and tested safe, these toys are made with natural rubber instead of the synthetic stuff used by other manufacturers. It comes from the sap of a tree, so nothing is cut down or destroyed to extract it, and the material is completely renewable. Other rubber products will contain fillers that lower the quality and make the rubber less sturdy. With Rubbabu, there are never any fillers, so you get a stronger, more durable rubber toy that will last for a long time. Another benefit beyond flexibility and strength is that this natural rubber is anti-microbial, dust mite resistant, mildew resistant, hypoallergenic and flame retardant. You can feel good about purchasing a toy made from renewable resources, and even better knowing that your children will be safe when they play with it. Even the manufacturing process is eco-friendly because only a very small amount of electricity is needed to produce each one. Six styles to choose from. Order Yours Today! Color Varies - (Red, pink, orange, yellow, light blue, dark blue, light green, dark green) PLEASE NOTE: Balls may come in different colors than shown. If you want a certain style AND a certain color, please indicate in the comments section at checkout, or call to place your order over the phone. Uses Play catch, roll them around, bounce them off the walls and so much more. 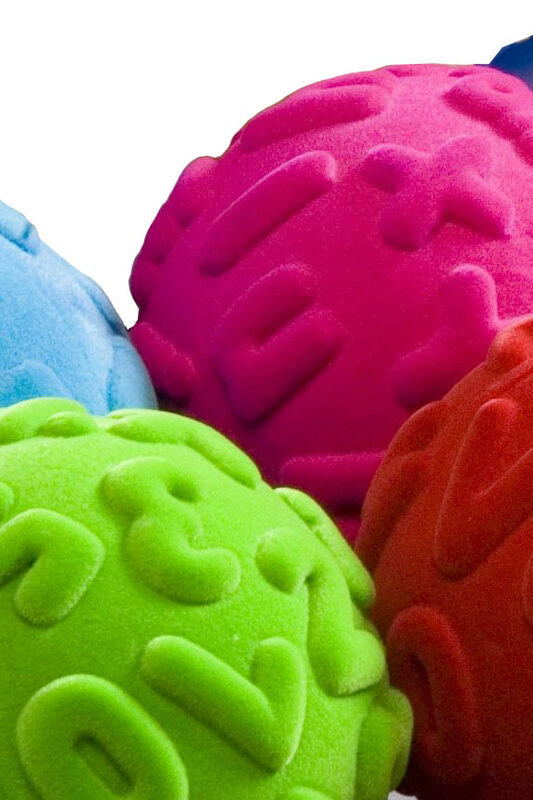 These squishy balls are perfect for tactile stimulation and safe fun for all ages. THe soft exterior and squish-ability keep kids coming back for more. Squishiness Squishy when gripped, but firm and sturdy otherwise. They bounce and squash when dropped, grabbed, tossed or stepped on making them easy to hold and fun to play with. Squishy toy balls made from natural rubber. No batteries, plugs or remotes. Rubbabu balls improve motor skills, encourage communication, increase sensory awareness and provide hours of stimulating play. 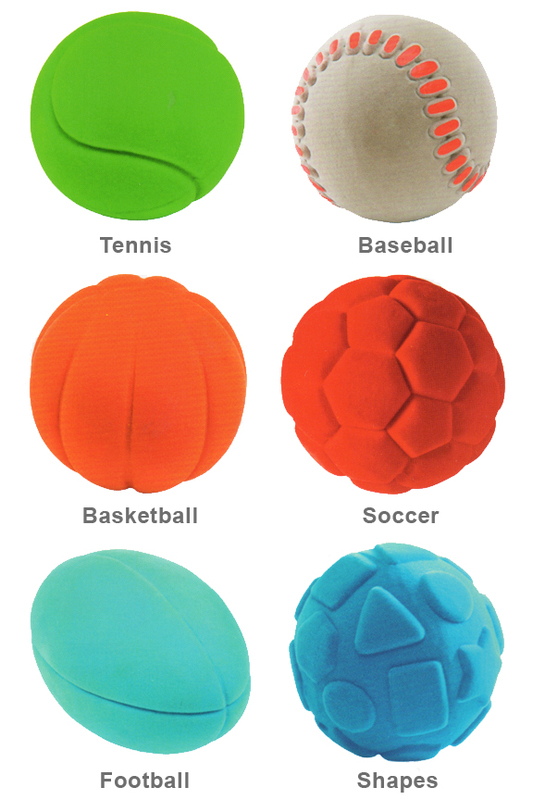 Boys and girls alike will love these uniquely shaped foam balls. Order Yours Today! Pros + Nice color -- curious to know the materials/ingredients to make it so vibrant. + Soft for children + Fun for adults (challenging b/c of the Con) Cons - Unbalanced materials, so it bounces awkwardly and feels lumpy. It's a Ball, so it should be uniform IMO. We gave 2 of these (crater & bubble) to our baby for her 1st birthday and she loves them. They are soft and she can grip them. A perfect first ball that wont hurt people or objects. They even bounce! Excellent that they are biodegradable. Note that the colors may be different from what is shown. Be sure to specify in the comments. I didn't know that before ordering & was surprised by the colors. Yes. We are happy to offer a color choice. Let us know in the comments at checkout, or call us to place a phone order. 2 of 2 Customer(s) found this Answer helpful. Spill Proof Lid Set For Water And Juice Bottles. Fun Little Suckers! A Large Set Of Suction Construction Pieces. 3 Pairs Of Animal Socks For Kids 4-8 Years Old. Rivalry Included! Non-Toxic And Washable. The Perfect Size For Bike And Scooter Chalktrail Systems. The Find And Hide Game Of Chickens And Eggs. Hexagon Shaped Building Blocks That Are Congruently Cool. Fun, addictive, and therapeutic. Keep your hands busy, and your mind focused with this spinning toy. A tough looking hand spinner toy with durable, zinc alloy construction.